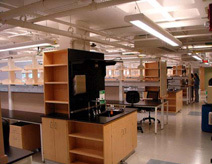 The 5,100 square foot renovation of the First Floor Lab was done to accommodate four faculty members and their researchers within the Faculty of Arts and Sciences, Organismic & Evolutionary Biology (OEB) Department. The renovated space now includes one (1) large wet lab, one (1) small lab, seven (7) small rooms for specialized research and equipment and two (2) restrooms. The scope included layout, mechanical, electrical, plumbing, fire protection, tel/data, and lab equipment upgrades. Construction was completed in August 2009.